“I was so afraid that I’d do this once and never do it again!” laughed Calla Gold—tall, thin, middle-aged—as she lay on the examination table in Evolutions Spa. A three-year veteran of Dysport (a skin filler similar to Botox), Gold wasn’t the slightest bit fazed by the skinny needle jabbing her face or the half-dozen women eagerly crowded around to observe. Instead, she was actually laughing as Evolutions Spa founder and cosmetic surgeon Dr. Terry Perkins cradled her head and carefully injected. 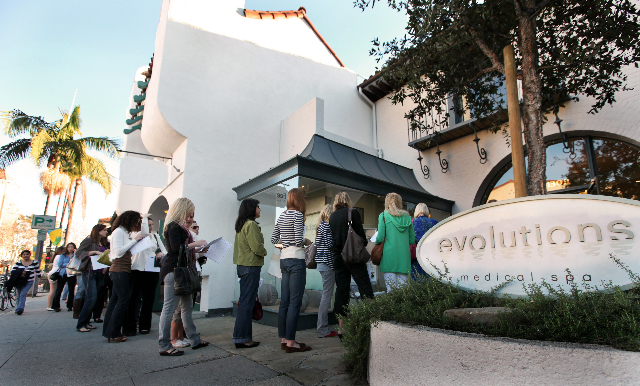 It’s not every day one gets the opportunity to observe an injection procedure, but Evolutions has given local women (and a few men, too) that chance every January during their anniversary open house. This year, the medi-spa celebrated its fifth anniversary—and its most financially profitable year on record, despite the recession—with extra-special festivities. 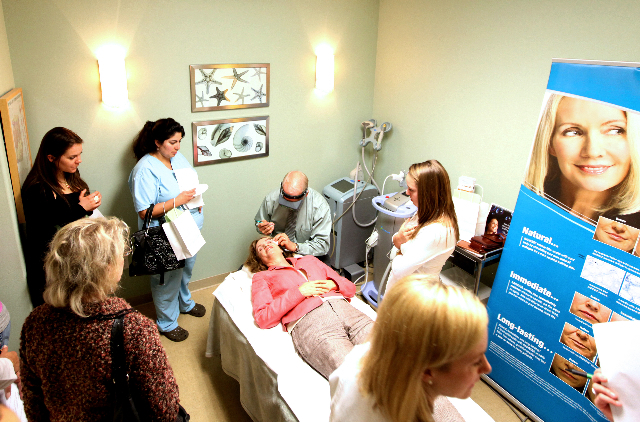 Reps from makeup and skin-care companies supplied loads of samples and demonstrations, and Evolutions nurses provided guests with mini-facials. Best of all, the open house was free and open to the public; people were lined up down the block an hour before the doors opened. Dr. Perkins was half scientist, half artist as he worked on Gold’s face. A member of the original approval committee for Botox, he commented to the room that the point isn’t to pull back one’s whole face until the muscles are completely frozen. Botox and its cousin Dysport are actually a watered-down form of the toxin botulinum, which is responsible for botulism, and works by temporarily weakening your muscles. Perkins, who has been a plastic surgeon for over 30 years, noticed the popularity of noninvasive procedures and opened the State Street spa in an attempt to better serve his aesthetically concerned clientele. He runs it with the help of his wife, his son, and a staff of nurses he personally trains. “He’s so good, he has groupies!” giggled Gold. Indeed, the tiny foyer is packed with a surprisingly diverse group of locals. More than a hundred people had come to experience Perkins’ talent and care, and he couldn’t walk more than three feet without being greeted by another happy patient. The afternoon was part education, part luxury, but wholly a success—a trend the spa wants to continue through the entire new year.